I'm falling back in love with modeling masks and have been impressed with the Lindsay masks so far. 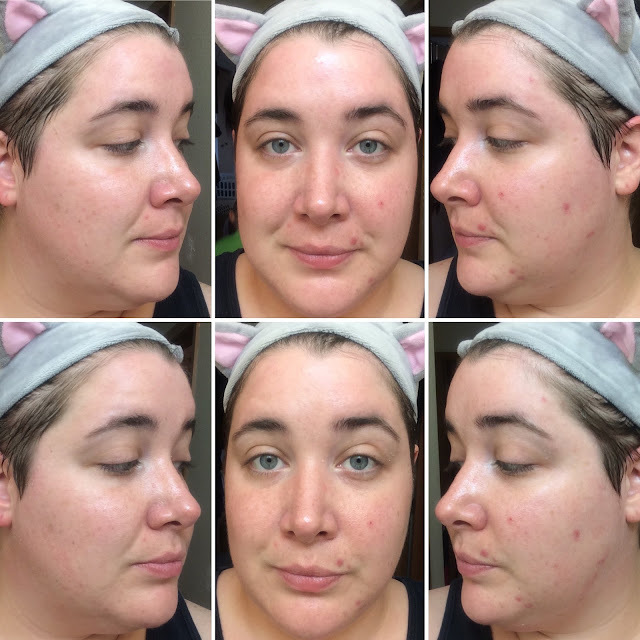 I'm looking for hydration as my skin has been dehydrated again, and looking a bit flaky in spots. The Lindsay Sea Blue Magic Mask is a two-step modeling mask that takes the guesswork out of measuring out the perfect amount of liquid in traditional modeling masks. 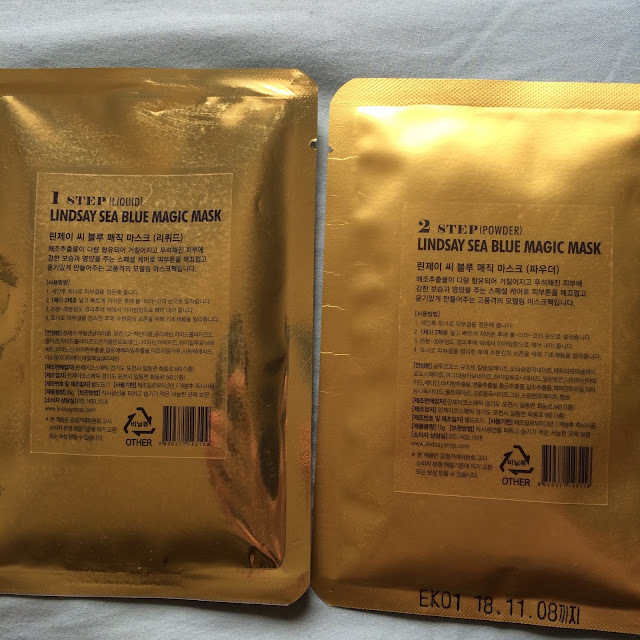 This variety of Lindsay Magic Mask contains natural sea-derived ingredients, including marine collagen, that balances the skins moisture levels to prevent dryness and flaking. Ingredients: Step 1: Water, Butylene Glycol, Algin, 1,2-Hexanediol, Glycerin, Hydrolyzed Collagen, Hydrolyzed Conchiolin Protein, Niacinamide, Hyaluronic Acid, Adenosine, Portulaca Oleracea Extract, Centella Asiatica Extract, Scutellaria Baicalensis Root Extract, Algae Extract, Mentha Piperita (Peppermint) Oil, Titanium Dioxide, Ultramarines, Chromium Oxide Greens, Sodium Benzoate, Fragrance. 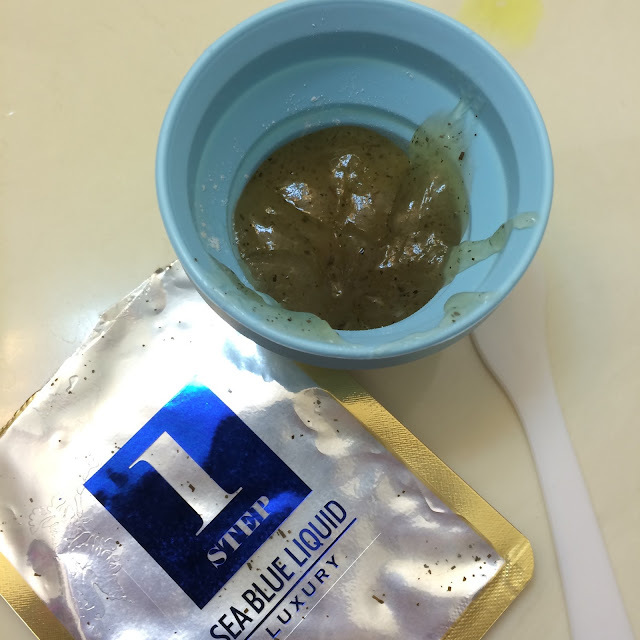 Step 2: Glucose, Diatomaceous Earth, Calcium Sulfate, Potassium Alginate, Tetrapotassium Pyrophosphate, Magnesium Carbonate, Allantoin, Niacinamide, Betaine, Portulaca Oleracea Extract, Centella Asiatica Extract, Scutellaria Baicalensis Root Extract, Algae Extract, Mentha Piperita (Peppermint) Oil, Titanium Dioxide, Ultramarines, Chromium Oxide Greens, Sodium Benzoate, Parfum. This kit will include 5 sets of masks, a collapsible bowl and a spatula. I pour step 2 (powder) into the bowl first, this way I can tell if everything from the bottom has been mixed up with the top. step 1 - liquid poured into bowl second. When mixed together you will have the consistency of pudding. Try to mix fast, and start applying right away - the longer you wait the drier it will become and the more difficult/lumpy the application will be. 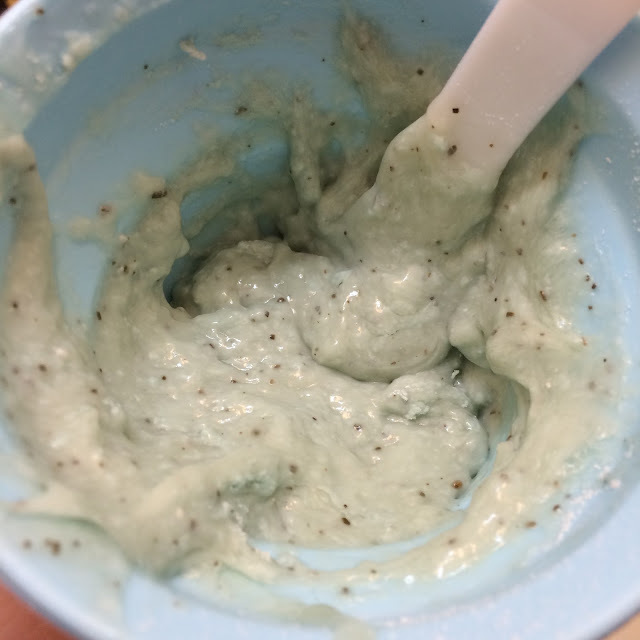 The mixture smells of minty ocean - a bit salty with a hint of peppermint, which I find somewhat relaxing. The mixture is a minty blue color, with specs of "oceanic" ingredients within. Try to apply a thicker layer towards the edges for easy removal. Once you spread it on like you're frosting your face, it's time to relax and let this mask set and work its magic on your skin. This particular mask I also spread over my mouth to try and hydrate my lips as well. 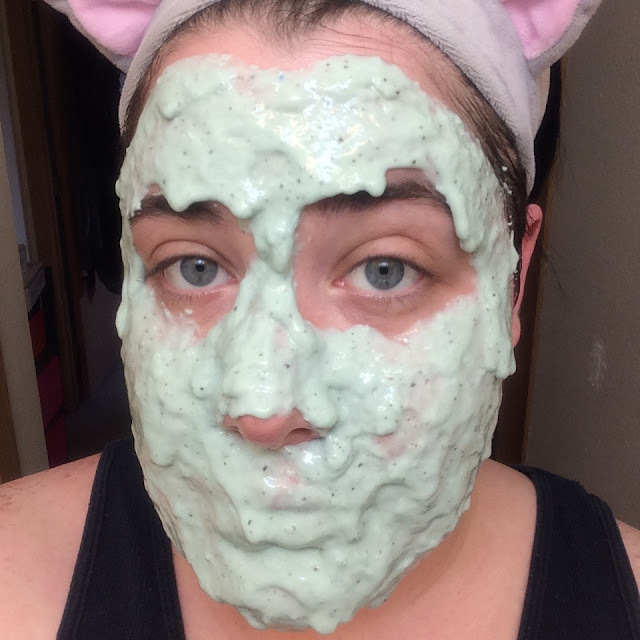 The mask felt cooling on my skin - which could either be from the peppermint and/or the fact that it's a jelly consistency on your skin. 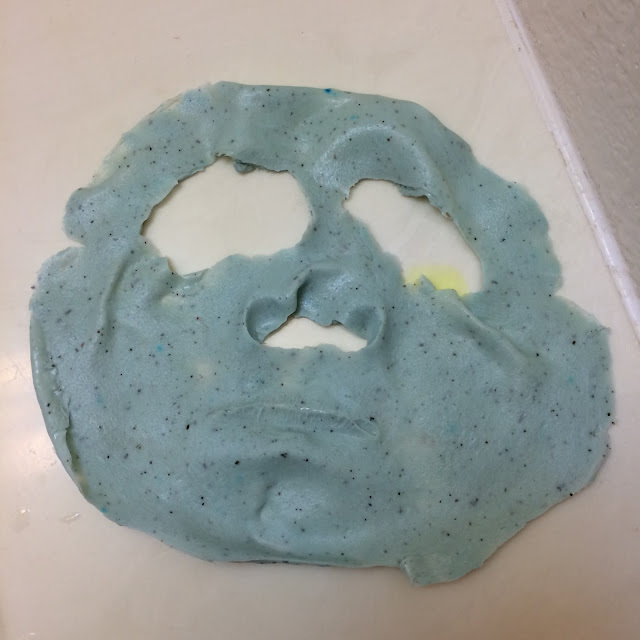 This modeling mask took a while to dry, and started to drip off of my face a few times before it started to set roughly 5 minutes in. 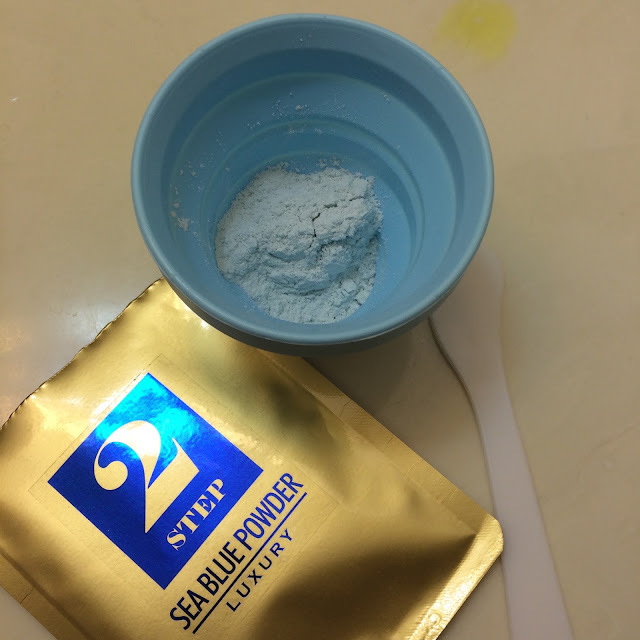 The directions suggest leaving the mask on for 20-30 minutes, but I found that this mask should be left on for 45-60 minutes because it stays softer so much longer. The mask took a bit of rolling around the edges to get off of the skin, but then removed easily in one big piece. After removal my skin felt so soft and plump! 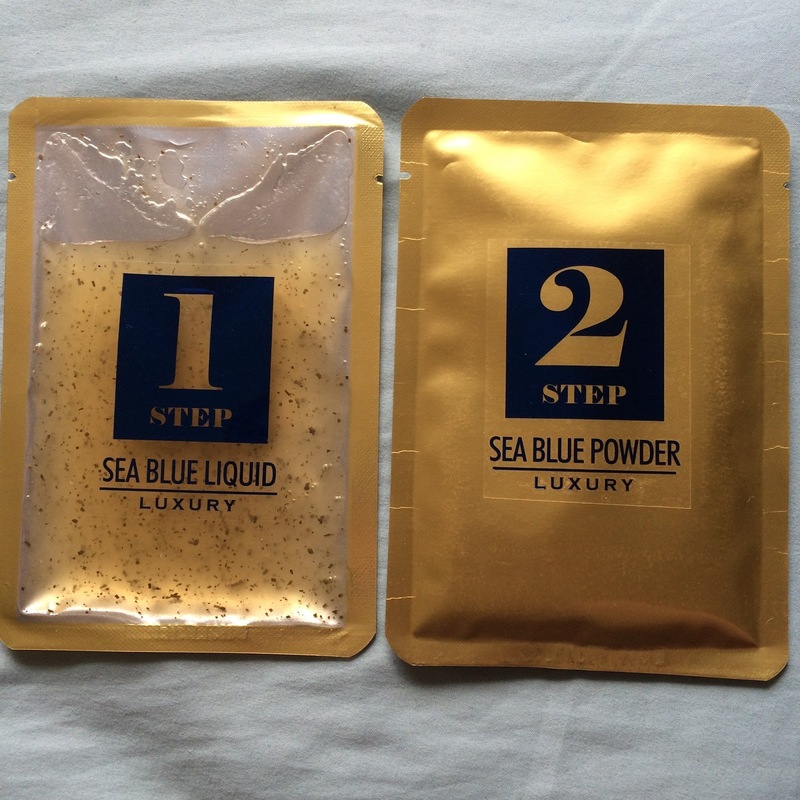 My skin was also a bit brighter, but the hydration was phenomenal - the real plus for this mask. I purchased this mask from Memebox USA*.